Co-founders Eliott Kessas (L) and Ross Mackay (R) with ambassadors Kim Kardashi-hen – Khloe Kardashi-hen – Kourtney Kardashi-hen. A NEW Scottish vegan food company say they’ve found the secret recipe to show the world that we no longer need animals for food. 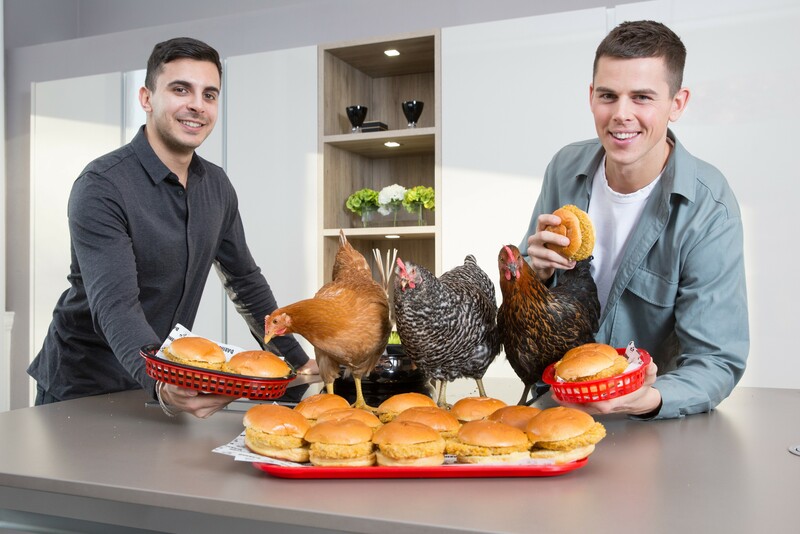 Glasgow-based start-up, DARING Foods say their new range of beef, chicken and other meat alternatives launching this month are unrecognisable from the real thing. Their range, about to hit restaurants across Glasgow and Edinburgh, are made solely from plants and simple ingredients, contain no palm oil, genetically modified organisms, hormones or antibiotics. Daring to eat into the UK’s £7billion plus meat industry, the company launched their bespoke vegan menu in 35 eateries across Glasgow, including burger joints BRGR and Buck’s Bar. The menu will also be available in Burgers and Beers Grillhouse on the Royal Mile, Edinburgh this month. The foods, which includes Moo-Free Burgers, Cluck-Free Fried Burgers, Cluck-Free Nuggets and Fishy-Free Fingers, will then be rolled-out to more than 1,000 restaurants across The UK by the end of the year. The ambitious start-up has also signed a major distribution deal with Lomond Foods and is in talks with several major supermarkets to create a retail offering. DARING Foods founders Ross Mackay from Glasgow, and business partner Eliott Kessas, a former corporate banker from Paris, decided to go plant-based three years ago, following a dare by friend who didn’t believe they could give up meat. But for the estimated 3.5 million vegans in Britain, motivations span environmental, health and animal welfare concerns. 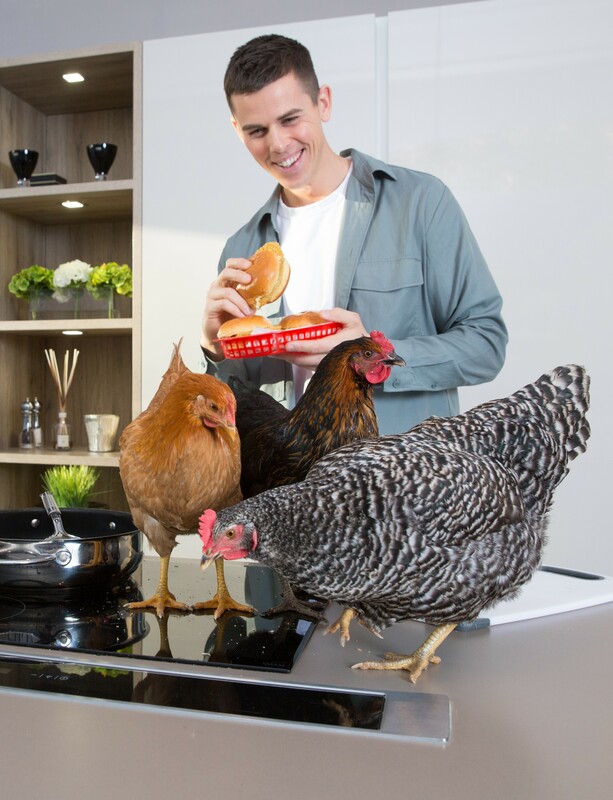 After one year of extensive research and development, and significant personal investment, they’re now ready to launch their burgers, chicken and fish alternatives to the world. Ross said: “Our meat alternatives taste better than the real thing. Society’s shift to a more plant-based diet is inevitable. People want to eat less meat, but there’s a real lack of options. We’re giving people those options by creating delicious, nutritious and sustainable foods directly from plants. The products help provide maximum nutritional value and minimal environmental impact. For example their innovative moo-less burger requires approximately 75% less water, 92% land usage and generate about 85% lower greenhouse gas emissions than the meat alternative.